Need inspiration for where to go on your next trip? Look at the Olympia Branch Awards for your inspiration! You can start working on an award today. 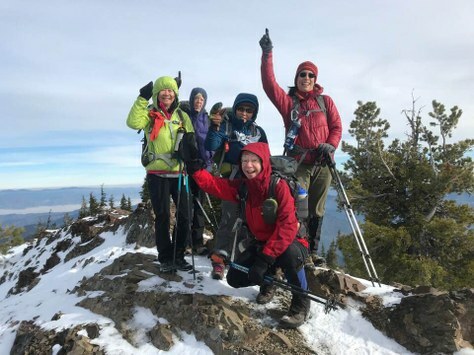 Eight Olympia Mountaineers recently earned climbing, scrambling, and hiking pins and badges in 2018. Mountaineers members can earn badges and peak pin awards for completing different objectives in Washington and beyond. If you're looking for new ideas, look no further than our list of Award Badges! And join us in congratulating the 2018 class on their collective achievements. Our history with award badges spans almost the entire existance of The Mountaineers. The earliest award was the Snoqualmie 10, started in the 1910’s, given for completing ten peaks in the Snoqualmie Pass area. To gain credit for the ascent, the climber had to check in at the Snoqualmie Lodge and pay a climbing fee. This was soon expanded to an additional award, the Snoqualmie 20, for completing an additional ten peaks. Awards are earned by members and verified and awarded by branch representatives. Kerry Lowry manages this process for our Olympia Branch, which proudly oversees 15 different Olympia Branch awards. In 2018, Jeff Williams and Henry Romer both celebrated reaching their 100th Mt Rainier peak and earned their pin and online badge. Marilyn Miller, Kari Durr, James Souza and Tristan Steed were presented the pin and online badge for hiking 100 or more one way miles on trails in the Olympic National Park and Olympic National Forest. Todd Mooney earned this pin and online badge for ascents of scramble peaks in the Olympic Mountains. This is the first in a set of three peak pin badges. Dan Lauren was awarded a pin and online badge for hiking to 12 Alpine Lakes in the Olympics. Dan was also recognized with a Very Honorable Mention for First Known Completion of Olympia Branch All 48 Listed Olympia Scramble Peaks and Olympia Branch All 40 Listed Outlooks. Marko Pavela climbed the 5 major Cascade Volcanoes in Washington and was presented with this pin and online patch. Jeff Williams reached 100 peaks listed as scrambles on the Mountaineers website. He earned a paperweight and online badge. Requirements for pins and badges can be completed over a multi year period. Mountaineers can work towards and receive a pin and badge from any Mountaineers branch. Trips can be both Mountaineers trips and private trips. For more information about Olympia Mountaineers Awards see our page on Olympia Award Badges or contact committee chair Kerry Lowry.